There is nothing more frustrating than having a problem and feeling helpless while some oracle on the other end of a nebulous contact form decides your fate. In the ideal world you would be able to solve your own problems without ever needing outside help, right? Our goal at NetBurner is to make the product in such a way that you rarely need support; not because we don’t want to help you, but to get you farther, faster. We still have a way to go and that’s why we take pride in the quality of our support, blog posts and community forums to fill those remaining gaps. Given that, there are some common things that you can do to help yourself without waiting for us, or if you’re just a do-it-yourselfer like me. Over and over we find our support engineers end up on a common path when helping to resolve issues. This article is an attempt to empower you to get on that path. If you can solve your problem yourself it’s often a quicker, more satisfying solution for you. And the quicker you get your project to market, the better. Turning a hex address into a code location. Starting with some basics. A lot of the tools and techniques described in this document will generate hex addresses. Turning these addresses into code locations is a key skill. When you build a NetBurner project it creates several files, two of which are: a MyProject_APP.s19 file to load on the board AND a MyProject.elf file, which you have probably been ignoring. Here’s the pitfall. This ELF file holds all the symbol and location information for your project. IT IS VITALLY IMPORTANT that the version of ELF file you use for turning hex addresses into code matches the APP file you have loaded on the board. So, if you’re going to do debugging, you must use the ELF file that was built at the same time as the app file. Here are three tools that will turn hex addresses into code locations. On a PC, just open a command window (cmd). Then at the prompt enter “Winaddr2line”. You’ll see the window shown below open. After you start winaddr2line, you load the ELF file. Then you put the hex addresses you are interested in the Address edit box and hit Decode. This shows you the code addresses that correspond to the addresses you entered. TIP: If winaddr2line is not working for you try running it as administrator. To run as an administrator: Hit “Windows+R” to open the Run box. Type “cmd.exe” to open the command window. After typing the command, hit “Ctrl+Shift+Enter” to run it with admin privileges. Simply hitting “Enter” runs the command as a normal user. So, if we have a hex address target for where our code is we then know how to turn that into a code address. How do we go about getting this hex address to begin with? When you code “traps” or “crashes” the default monitor trap messages are not very useful. SmartTrap gives you a much more useful output. Usage is simple. When the system traps it outputs debug messages over the console. The trap report shows you the next instruction that was supposed to be executed AFTER the offending instruction (Highlighted in Yellow above). It also shows you the call stack (Highlighted in Green above) for the task that was running when the trap happened. Look for the task entry that says “running”. Lastly, it will tell you why it trapped (highlighted in Red). In this case it says, “debug interrupt”. On NetBurner’s MCF5441X based platforms the system does a debug trap for null pointers. In the other platforms a null pointer will give you an access error. TaskScan is a tool that will tell you what all the tasks in your system are doing. Using it is pretty much a two-step process. It is included in the NetBurner tools installed on your computer when you first set up your device. Then launch the TaskScan utility. You can do this via the search bar in Windows or open Run (Window + R) > taskscan.exe > Enter. The application window will then open. Select your matching ELF file via “Browse” and find the device. Hit “scan”. Pro Tip: if you don’t have the ELF file with you, TaskScan will still work, but will only show hex addresses. Often one uses printf debugging, it lets you print out messages to tell you what your code is thinking. This is a tried and true debugging method that is as old as coding itself. There is just one catch… your serial cord is too short, or your serial console terminal is actually used by your end application and you have no access to it. Never fear, there is a solution! We can use the NetBurner syslog utility to printf to the syslog UDP port and to monitor it over the local network segment. Just like the others, this tools is located in C:nburninclude . Once you’re sending stuff to syslog (UDP broadcast on port 514), you need a method to see the data. I recommend that you use our UDPTerminal.exe utility and set the local port to 514 in the Local (listening) Port field in the application and press Close when done. If you can’t find do the following Run (Window Button + R) > udpterminal.exe. The application window is shown below. On all NetBurner releases after 2.8 we have enabled stack checking. We’ll want to use it. This will automatically generate a trap when your code exceeds its allocated stack space. / #define UCOS_STACKOVERFLOW (1) /. Then in the NBEclipse IDE application right click on “Project” and select “Properties”. Under “C/C++ Build”, click “Settings”. 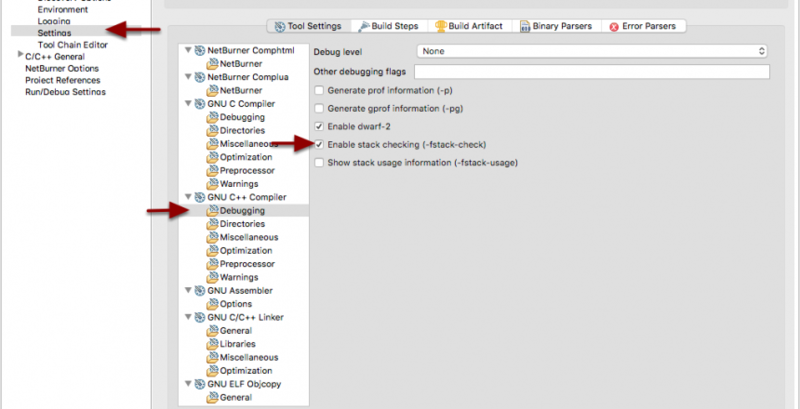 Under “GNU C/C++ Compiler” -> “Debugging”, select the checkbox “Enable stack checking”. See image below. Rebuild the system files by clicking “NBEclipse”-> “Rebuild” modified system files. Rebuild the system files by typeing make cleanall. If you’d like more on stack debugging here’s one of our posts on debugging your stack memory overflows. The Network dies now what? As always please join in the conversation and leave a comment, suggestion or question below or in our forum! UPDATE: Find Part II of this guide here!